We’re sure you recognise these little guys – that’s right, Rafiki and Timone are meerkats, and they’re a part of our meerkat mobs here at Oreo and Friends. The remaining members of the mobs are Jambo, Bibi and Soori, and together they make for fascinating viewing! 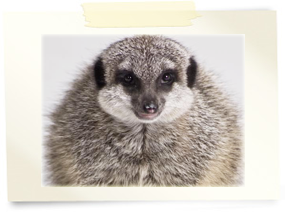 Our meerkats love nothing more than chomping on mealworms, digging in their sand – and standing up on their hind legs to keep watch, of course! Rafiki and Timone have a very important role here at Oreo and Friends – they’re helping us to spread a vital message, and to raise animal awareness! For a number of reasons, the novelty of keeping a meerkat as a pet has become very popular recently, and our boys are very concerned about this! While these creatures may be cute and fuzzy to look at, that doesn’t necessarily mean that they’ll make a great household pet – quite the opposite, in fact! 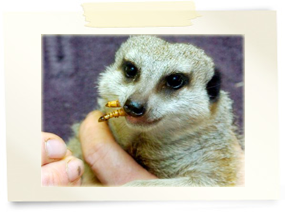 Remember, it’s one thing to enjoy spending an hour or two with a meerkat at an encounter, but it’s quite another to spend every day caring for one and working to make sure that its extremely complex needs are met! The sad truth is that people are bringing meerkats home and expecting them to behave like a cat or a dog, when in reality they just aren’t suited to domestication. These poor creatures then end up living in awful and unsuitable conditions because their new owners had no idea how complicated they would be to care for. Rafiki and Timone want to put a stop to this! 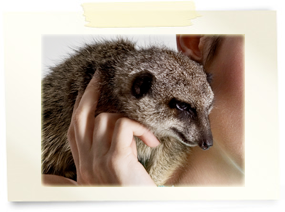 Together with them we hope to educate people, and to help them to understand that meerkats aren’t ‘a fashion trend’ or ‘the latest thing’ – they’re living creatures that deserve to be cared for properly. Please feel free to read more about this on our animal welfare page.